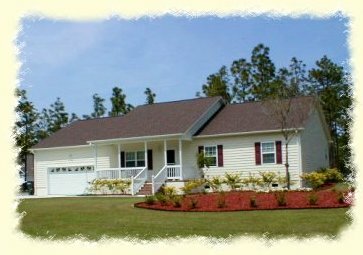 Single Story Home Under 2500 Sq.Ft.-LS981024-Carolina Coastal Designs, Inc. This charming 3-bedroom home, with its surrounding backdrop of large pine trees, is located in the countryside community of Boiling Spring Lakes, North Carolina. A southern style covered porch on the front welcomes you to this meticulous home. The entry foyer opens to a spacious great room with a corner gas fireplace. A modern kitchen and dining area both open onto a deck for outdoor dining. The laundry room and a private office are located off the dining room and are also accessible from the 2-car garage. The master bedroom suite, along with two guest bedrooms and a separate full bathroom, are set along the right side of the house away from the busy living areas.